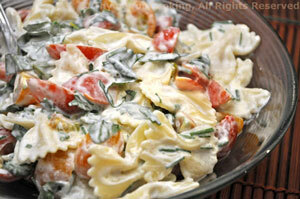 Pasta, creamy goat cheese sauce, Thyme for Cooking easy pasta side dish. A simple sauce of goat cheese and fresh chives makes a light pasta side dish. While pasta cooks: Heat stock in a small saucepan. Add goat cheese and stir until cheese is melted. Remove from heat and add herbs. To finish: Pour sauce over pasta, add cherry tomatoes, stir well and serve.